Corey and I skipped our Wednesday morning BodyPump, with plans to try out the class at the gym closer to our new home on Thursday. That’s exactly what we did! We invited Corey’s younger brother, Drew, to come along with us for his first BodyPump experience. I have to say, I was highly disappointed. The class sucked. The instructor was not in shape at all (which always bothers me for some reason), she made the strangest faces, and barely gave any instructions, which made it hard for us, as regulars, to follow along, so I can only imagine how Drew felt. To make matters worse, the gym closest to our house is geared more towards an older crowd, so the instructor did not teach release 77- she pretty much made up her own, easier routine, which was utterly terrible. What a fail! After class, I really wanted to get in some cardio, since I felt that I barely got a respectable workout in. The boys weren’t feelin’ it, but I was able to get in 10 minutes of running on the treadmill before they forced me out the door. 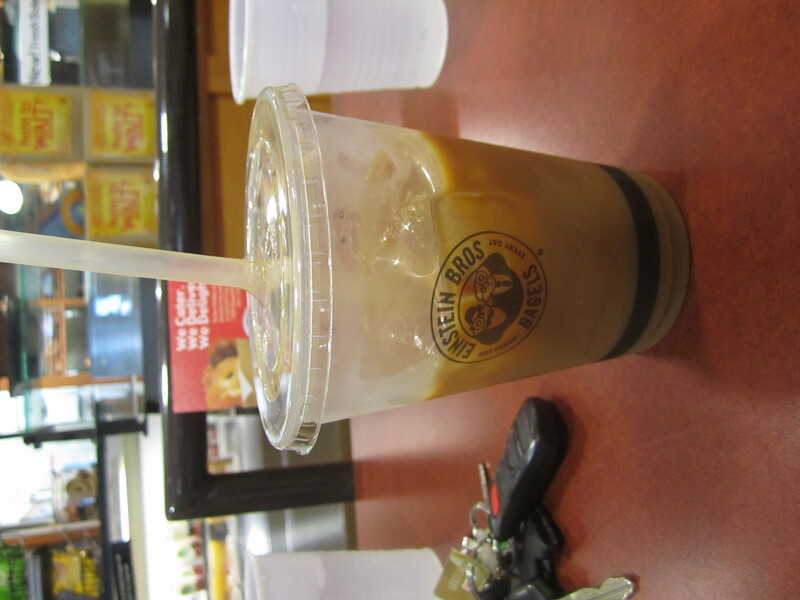 It was only 6:45AM when we left the gym, so Corey offered to treat Drew and I to breakfast at Einstein’s. 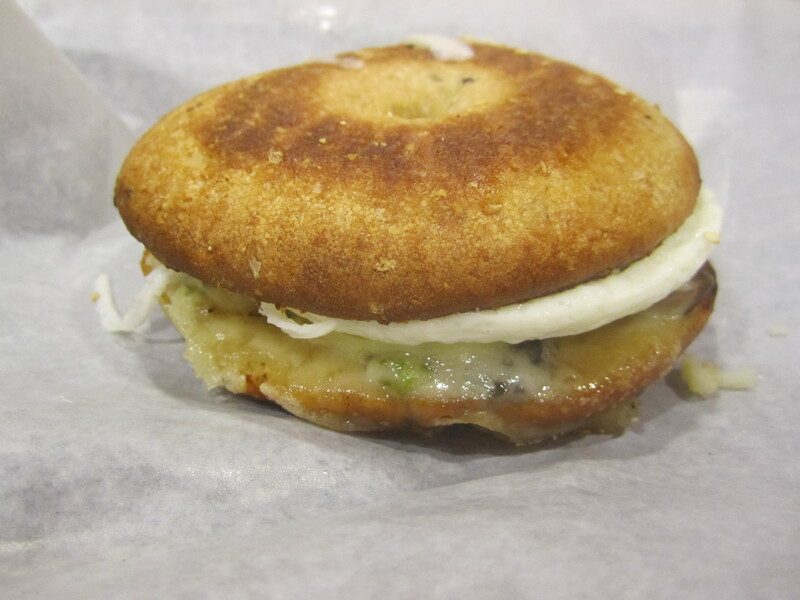 I ordered the same thing I had on Tuesday– the Mushroom, Asparagus and Swiss Thin- but without the tomato spread. I also had an iced coffee with skim milk and Splenda. My sweet tooth was in overdrive yesterday. 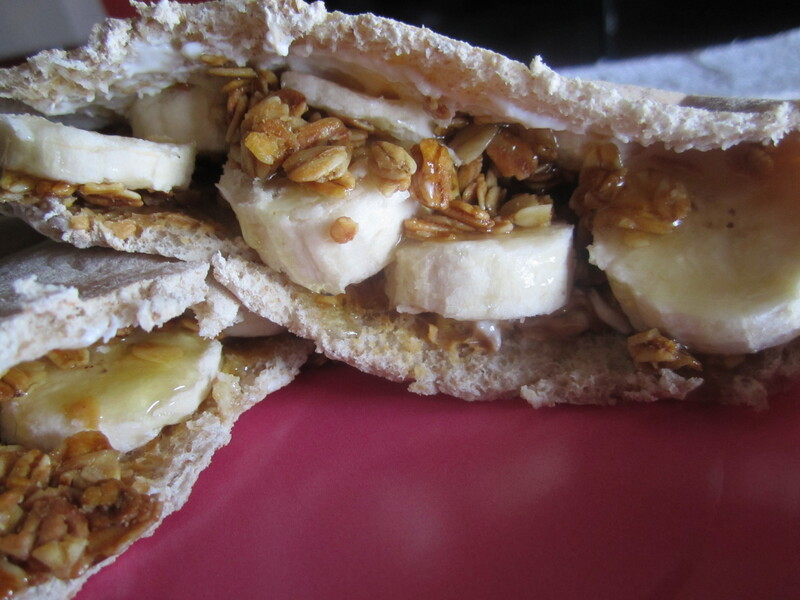 By the time lunch rolled around, I was in no mood for veggies or a sandwich- I wanted something sweet! I got creative, and decided to attempt making one of me and Corey’s favorite breakfasts at Powerhouse Cafe. 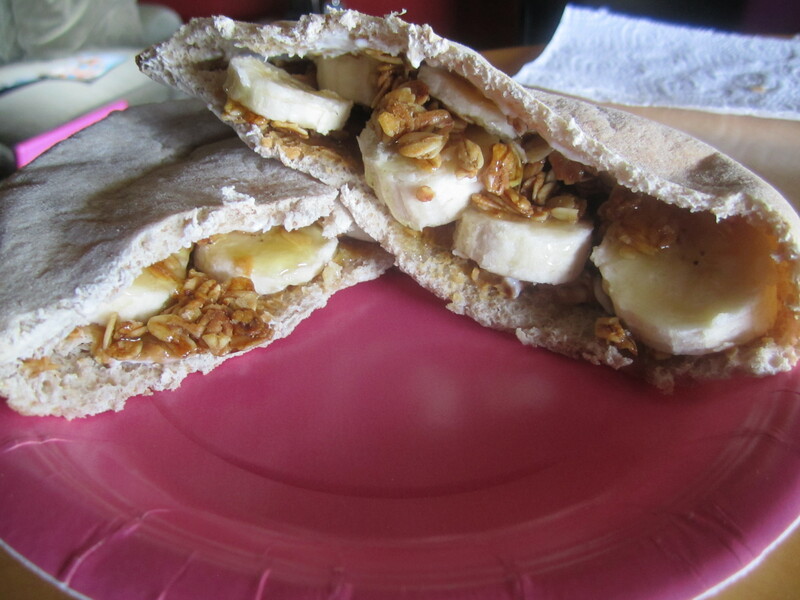 They have a phenomenal breakfast pita, with peanut butter, banana, strawberries, granola and honey, all instead a homemade whole wheat pita. 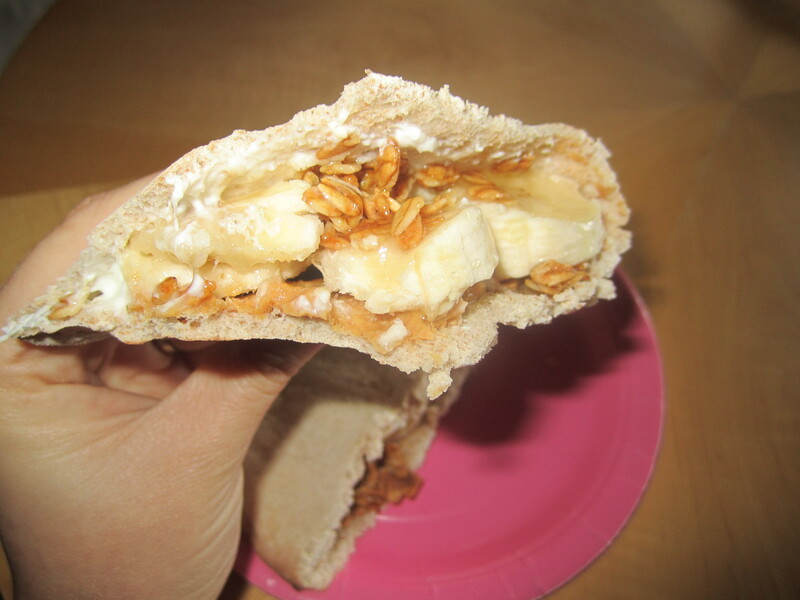 My finished pita included: one half spread with Lemon Chobani Greek Yogurt, the other half spread with peanut butter, topped with banana slices, a sprinkle of granola, and a drizzle of honey. It was almost as delicious as the pita from Powerhouse Cafe, but I definitely missed the tanginess of that the strawberries give to it. Next time! 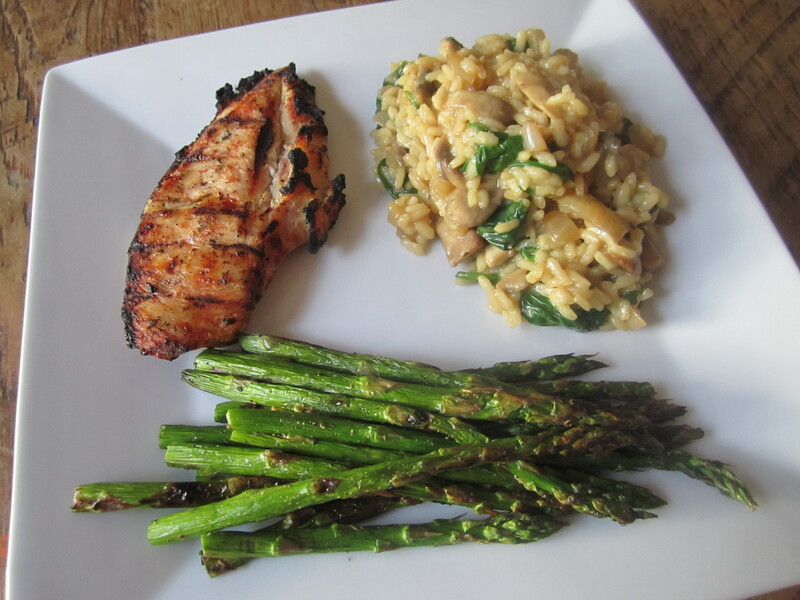 When Corey got home from work, I sent him out to the grill with some chicken breasts that had been marinating in Kraft Vidalia Onion Dressing overnight, along with some fresh asparagus. 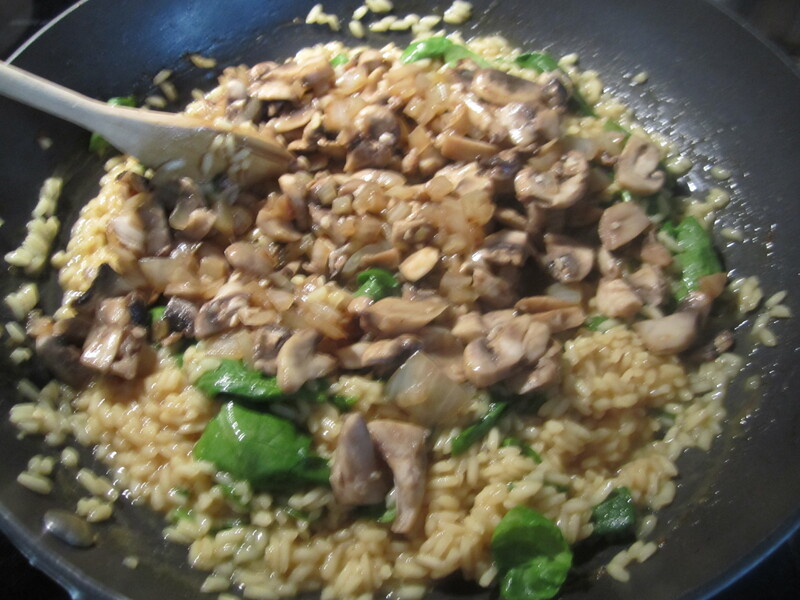 While those were cooking, I got started on a veggie-ful risotto! 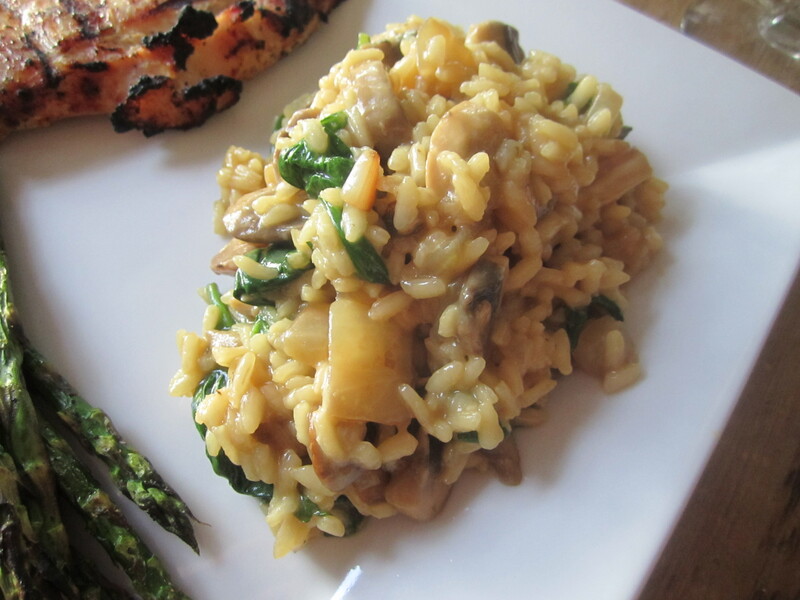 Risotto is one of my favorite side dishes, or meals, period. A lot of people have the misconception that it is a really heavy, fattening dish, and that is understandable- its creamy texture would lead you to believe that it has tons of calories! 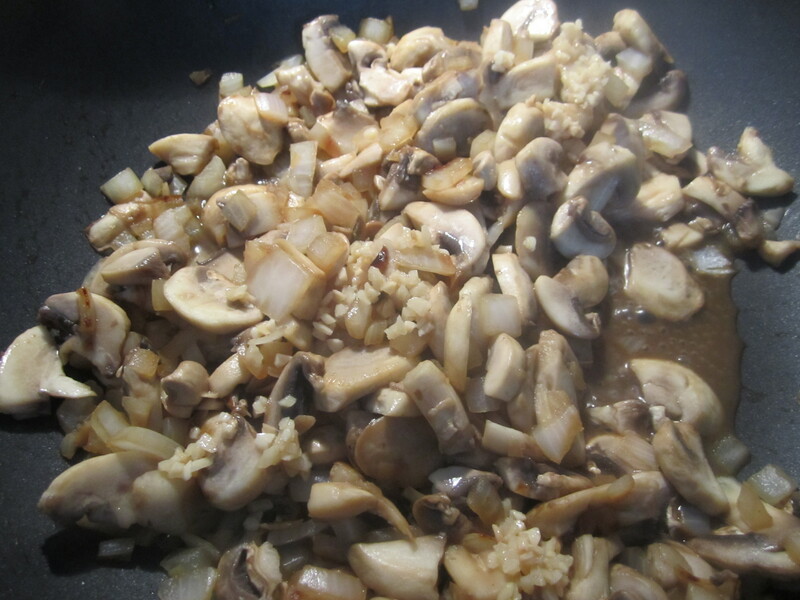 However, the creaminess actually comes from continuous stirring, and the slow addition of chicken broth or stock- the stirring helps release the starch in the rice, resulting in a creamy, rich dish, without all the fat. Heat a skillet over medium heat, sprayed with non-stick spray or EVOO. Add the onion and cook until translucent. 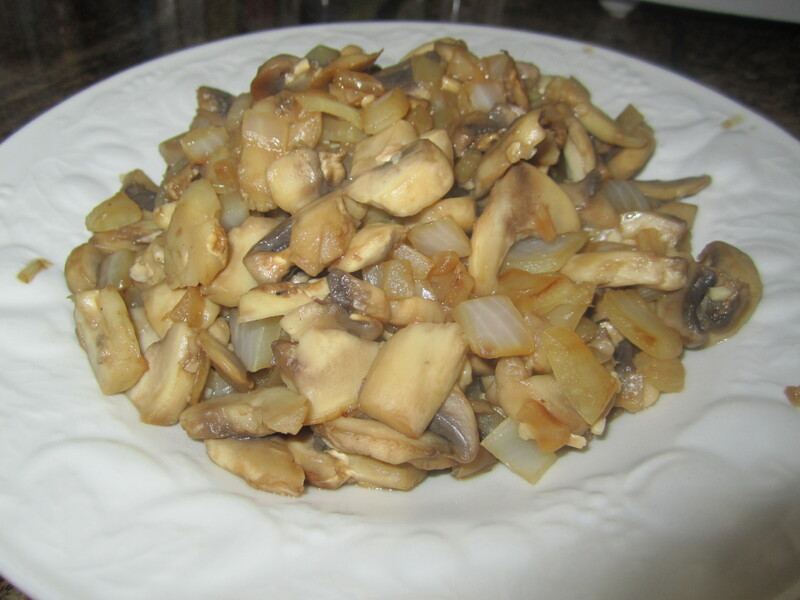 Add the mushrooms and cook until browned, about 5 minutes. Add the chicken stock or broth to a pot, place over medium heat, and keep warm (not boiling) while following the next steps. 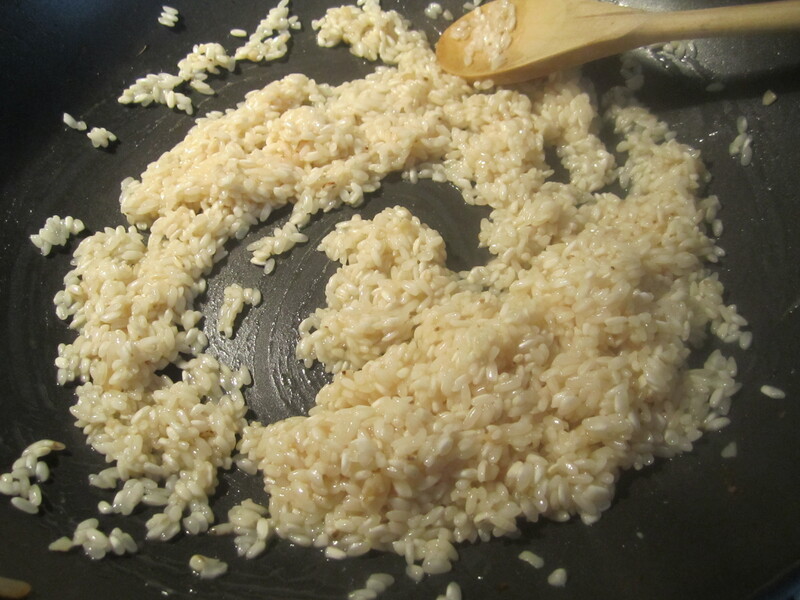 Spray the skillet with nonstick spray, place over medium heat and add the rice to the skillet. 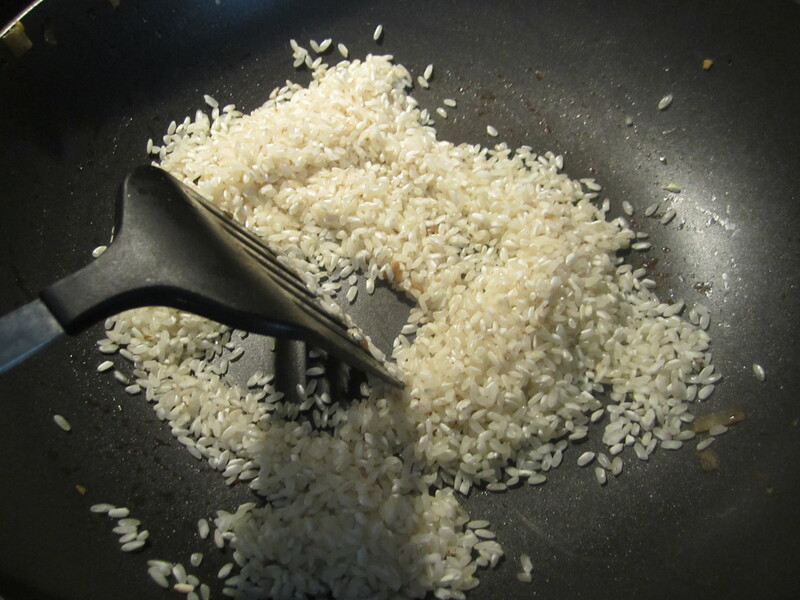 Move the rice around with your spatula and toast for one minute, being careful not to burn. 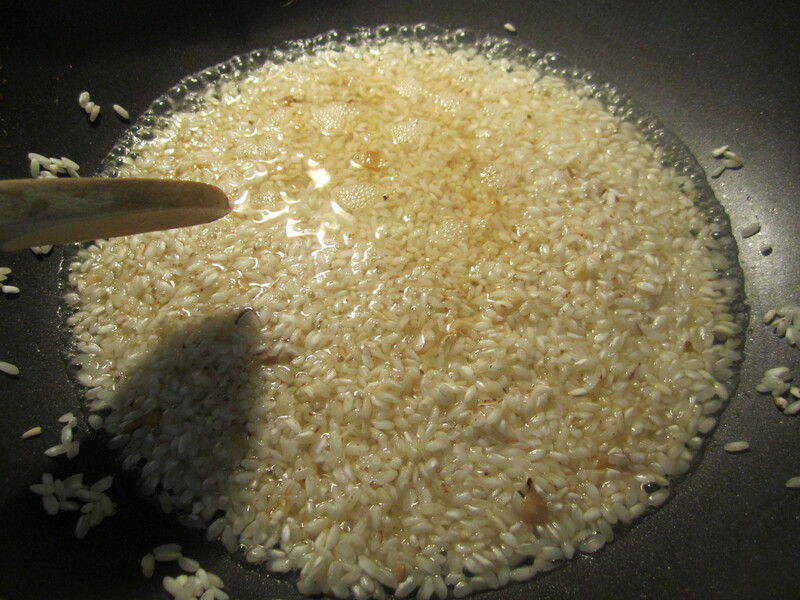 Add the white wine, stirring the rice until the wine is completely absorbed. 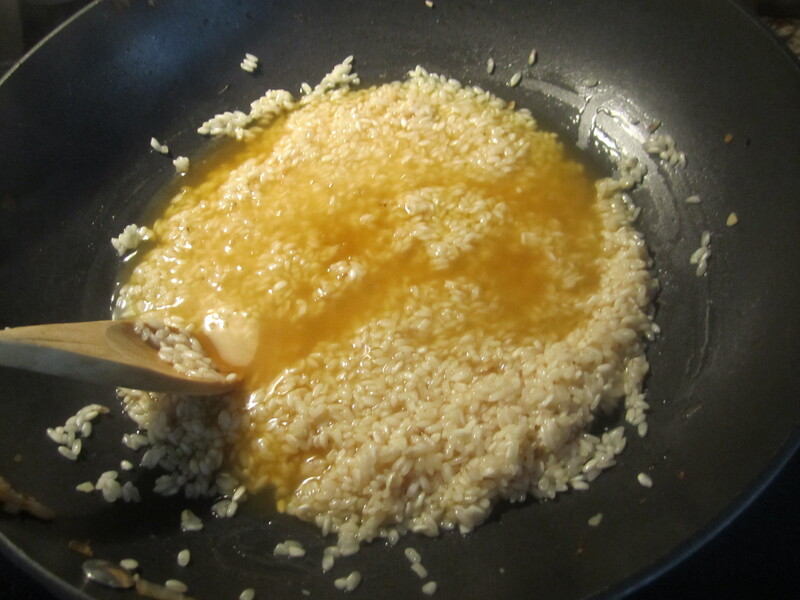 Add a ladle or measuring cup of warm chicken stock or broth (I did a 1/2 cup to 3/4 cup at a time) to the rice, stirring continuously until it is absorbed. 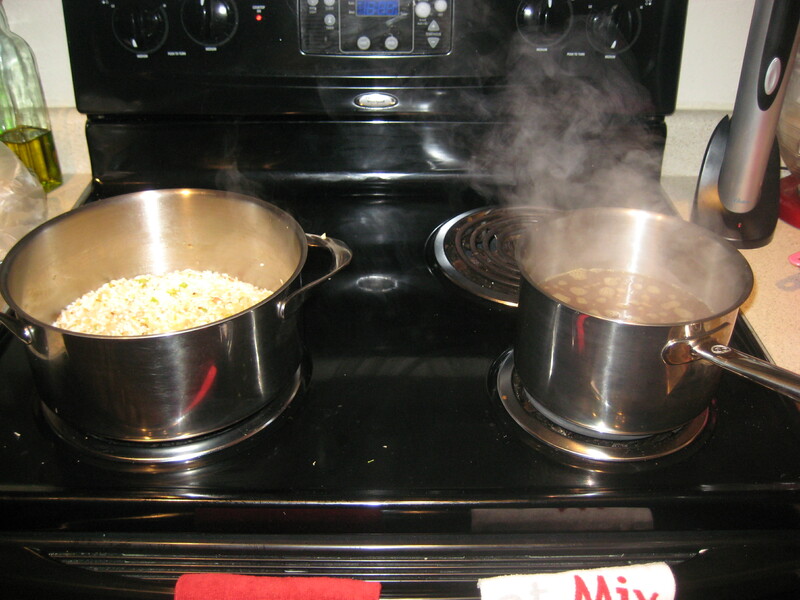 Repeat this step until you have added 4 1/2 cups to the rice. This process should take approximately 20 minutes. Remember to stir continuously. You will know you are finished when the rice plumps, and when you taste it, it is not mushy, yet not crunchy. 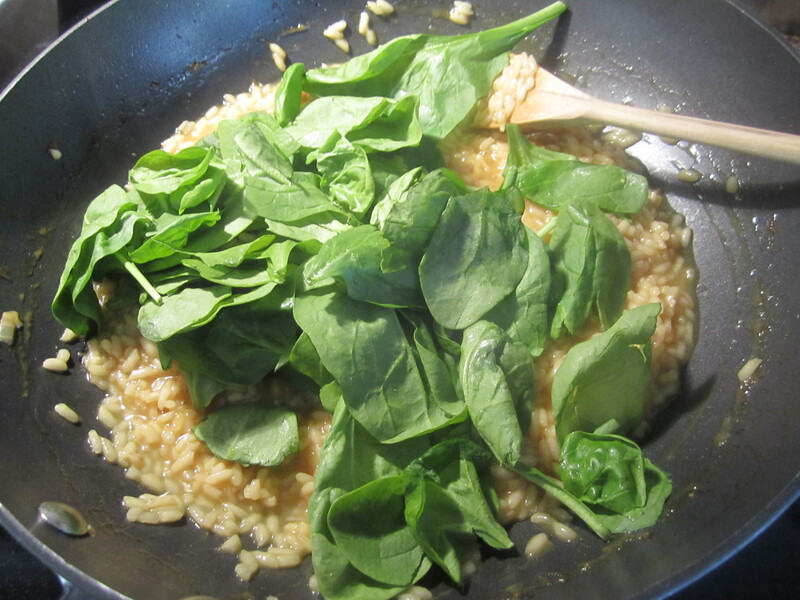 At this point, lower the heat, add the fresh spinach and stir until wilted. 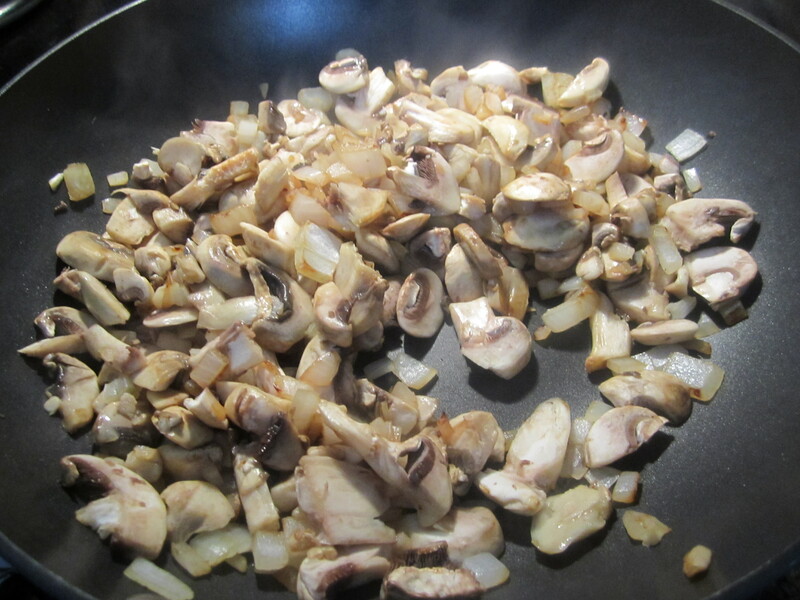 Add the cooked onion and mushrooms that were set aside. Add the salt, Smart Balance and parmesan cheese, and stir. This dinner was just fabulous. We both agreed that grilled chicken is far superior to baked chicken. We’re so happy to have a grill back in our lives! I’m never one to toot my own horn, but this is definitely one of the best dinners I have ever eaten. Corey and I stopped by our local fish market this afternoon to pick up some fresh seafood for this week’s dinners. We are big fans of scallops, and they were having a sale on bay scallops, so we decided to bring some home. Bay scallops are the small ones, not the big diver scallops that you get at fancy restaurants (which are also delicious, of course!). 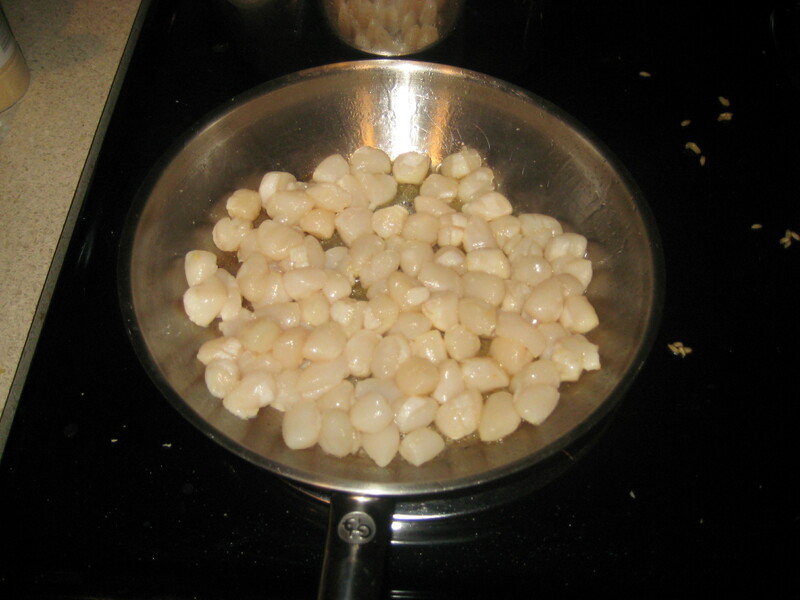 I often use bay scallops for pasta dishes, but Corey was actually the one who suggested we make a risotto with our scallops. The wheels started turning in the kitchen part of my brain, and this recipe was born! 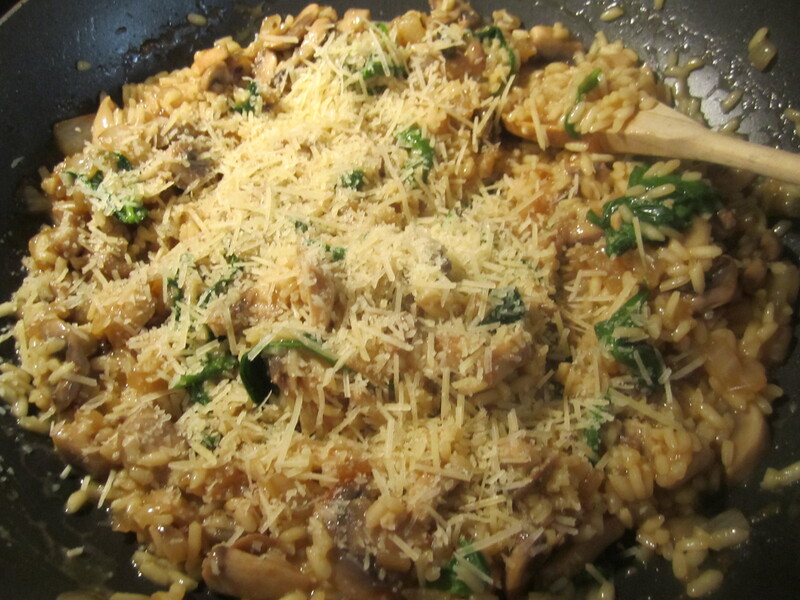 I think most people automatically assume risotto is a very fattening dish, because of its creamy texture and rich flavor. However, there is not an ounce of cream in this recipe! 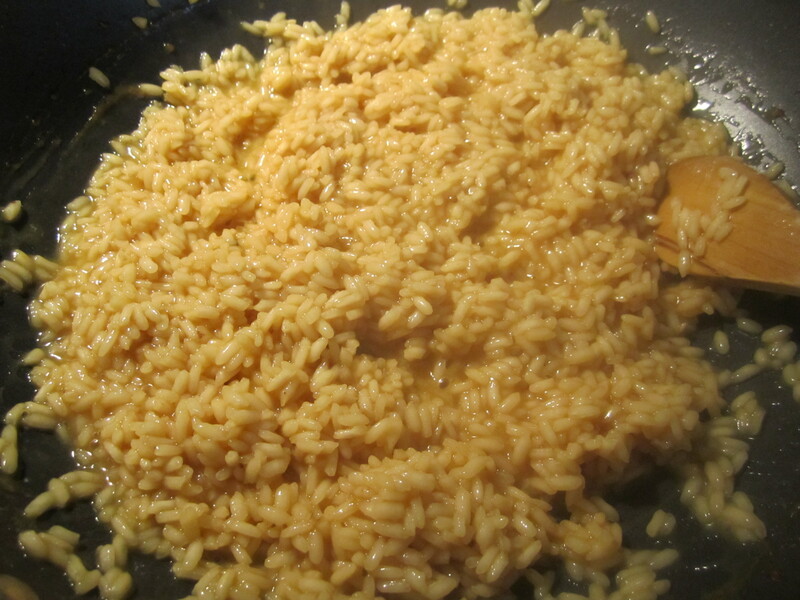 The creaminess comes from the starches in the rice that develop from the continuous stirring that you have to do when making risotto. I love dishes that taste fattening but really aren’t! 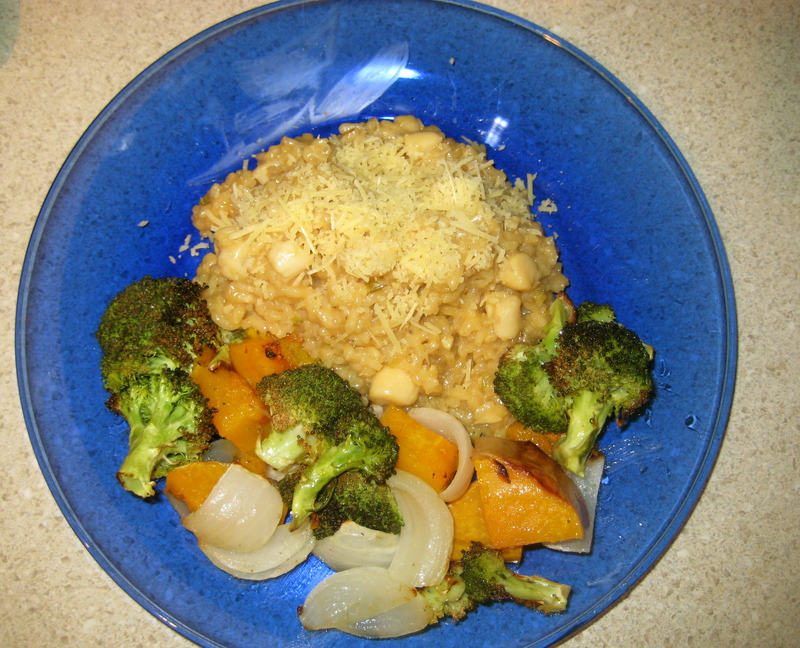 I had a bunch of vegetables that I bought last week at the produce market that needed to be used up, so instead of just making my usual roasted broccoli, I decided to throw in a Vidalia onion and some chunks of butternut squash. They added great color to my plate and were oh-so-flavorful! I have to warn you, this dish is a major arm workout! You really can’t leave the stove for the 20 minutes this takes to cook, because you have to keep stirring everytime you add liquid to the pot. It’s worth the effort! You will need two pots for this dish. In a larger pot, heat the 4 tablespoons EVOO over medium heat. 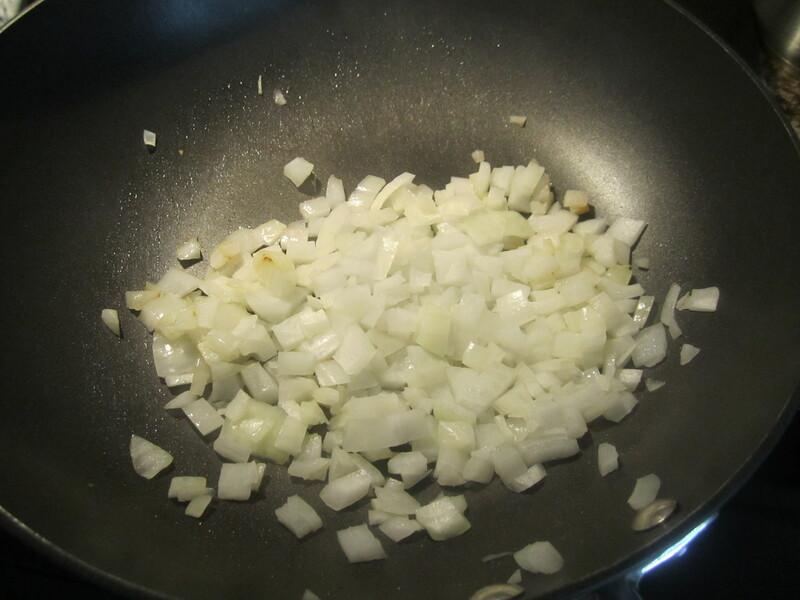 Add the celery and onion to the pot, and cook until soft, about 5 minutes. In the other pot, pour in the 8 cups of chicken stock and heat over medium until hot. Add the garlic to the pot with the celery and onion. Cook for a minute. Pour in the white wine and cook, stirring continuously, until almost all the liquid is evaporated. 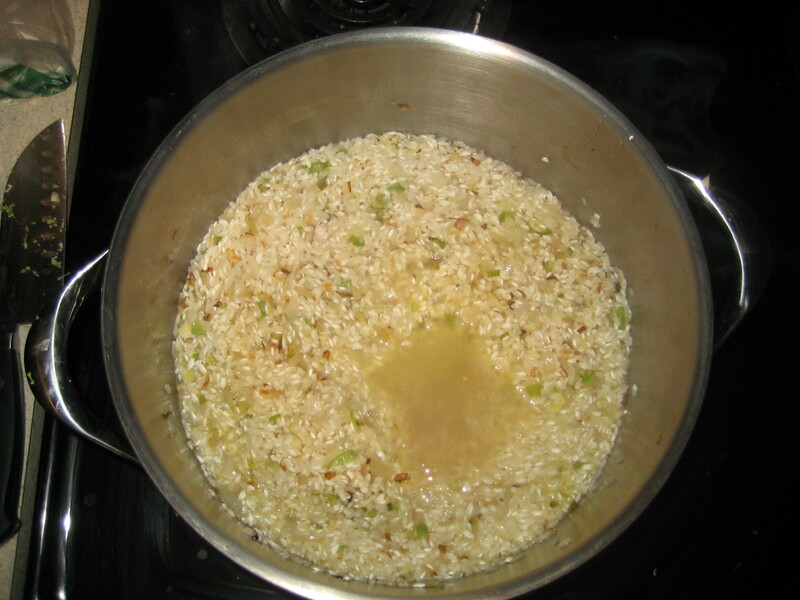 Add one cup of chicken stock to the pot, and continue stirring until almost all the liquid is absorbed by the rice. Repeat this step for about 20 minutes, or until you taste the rice and it is cooked but still has a “bite” to it. Remove from heat. Add the parmesan cheese and the butter and stir together. Cover with a lid and set aside. In a skillet, heat 2 tablespoons EVOO over medium-high heat. Season the scallops with salt. Add the scallops to the skillet and sear on one side for about a minute. Turn over and continue to cook for another 2 minutes. Squeeze the lemon over the scallops. Add the scallops to the risotto and combine. Season with salt and pepper, to taste. Serve with an extra sprinkling of parmesan cheese. Preheat oven to 500 degrees. On a baking sheet, lay out the vegetables in one layer. Pour EVOO over top of the veggies, and sprinkle with the salt and garlic powder. Use your hands to toss everything together. Place in the oven for 15 minutes. 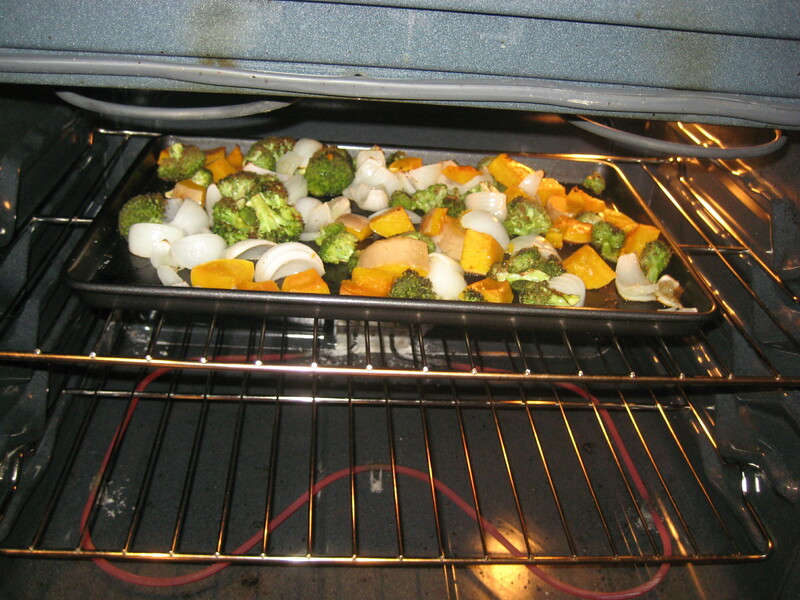 Reduce oven temperature to 425, use a spatula to flip the vegetables, and continue cooking for another 15 minutes.